Fig. 10-10. Rotation Angle Geometry for a 90-Deg Sun-Earth Angular Separation. Note that the measurement density is more nearly uniform than in Fig. 10-8, but is still low in the vicinity -of the null. We have seen that the attitude uncertainty depends on the measurement uncertainties, the measurement densities, and the correlation angle (or angle of intersection of the attitude loci). In this section, we give a formal definition of the correlation angle, expressions for the correlation angles among the arc-length and rotation angle measurements described above, and an example of the application of correlation angles and measurement densities to determine the accuracy of the Sun position in a two-axis Sun sensor. As an example of the correlation angle for two arc length measurements, consider the Sun angle/nadir angle correlation angle, ©«/,,, shown in Fig. 10-11. When the correlation angle is 0 deg or 180 deg, the two small circles are tangent and the two measurements give essentially the same information about the attitude. Thus, when the correlation angle is small (or near 180 deg), the attitude uncertainty is largest, because the component of the attitude tangent to the two circles is essentially unknown. In contrast, when the correlation angle is near 90 deg or 270 deg, the two measurements are independent and the attitude uncertainty is smallest. Qp/n, = 0 implies that the constant /? and constant 4> curves are tangent. As is most easily seen in Figs. 10-8 and 10-9 (c), this occurs when the attitude lies on the great circle containing the Earth and the null* (shown as a dashed line on the figures). Consequently, along this great circle, no information is available on the component of the attitude tangent to the constant p and 4> curves. Also by symmetry with /?/$, 0,/<d = O when the attitude lies on the Sun-null great circle. where n= 1 jf the vectors are in the order G^, G,,, G^ and n = 2 if they are in the order G^, G0, G,,. Equation (10-9) is particularly useful for the approximate evaluation of correlation angles, because frequently one or two of them are easy to estimate. *This is true everywhere along the Earth-null great circle except at the Earth, Zenith, null, and antinull, where the tangent to the constant 4> curve is undefined. Fig. 10-12. Addition Theorem for Correlation Angles. The sum of the correlation angles for any set of measurements must sum to a multiple of 360 deg. Correlation angles will be used extensively in Chapter II to determine the attitude accuracy from various measurement types. To illustrate the versatility of the correlation angle and measurement density concepts, we analyze here the internal accuracy of the solid angle Sun sensors described in Section 6.1. Specifically, given a sensor with a circular field of view 128 deg in diameter, and a uniform reticle pattern with an 0.5-deg step size (or least significant bit) on both axes at the boresight, we wish to determine the maximum inaccuracy in the measured position of the Sun, assuming that there is no error in the sensor measurements. Our procedure will be first to determine the type of measurement made by the Sun sensor and then to determine the measurement densities and the correlation angle between the two sensor measurements. * The locus of Sun positions for constant T or A is a great circle only if the index of refraction, n, of the material inside the sensor is 1. If n ^ 1, then the loci will deviate slightly from great circles and A and T will not be independent In this example, we will assume n= I, as is commonly true for high resolution sensors. size on the celestial sphere is 0.5"/d. At the boresight the measurement density is 1 and the Sun angle is being measured in 0.5-deg steps; along an axis at the edge of the sensor (for example, at T = 0, A = 64 deg) the density is 1 /cos264° = 5.20, and the steps are 0.5°/5.20 = 0.096 deg. Thus, ignoring problems of diffraction, reduced intensity, and manufacturing imperfections, all of which tend to be worse at the edge, the resolution at the edge of the sensor is approximately five time better than at the center. To evaluate the uncertainty in the position of the Sun, we still need to determine the correlation angle, 0A/r, between the two loci. This can be obtained by inspecting Fig. 10-13. Specifically, 0A/r equals the rotation angle about the Sun from the sensor + Y axis to the - X axis. The angular separation between the X and y axes is 90 deg; therefore, the correlation angle at any point in the sensor field of view may be evaluated using Fig. 10-10 with the Sun, Earth, and null replaced by the sensor + Y axis, the — X axis, and the boresight, respectively, as shown in Fig. 10-14 with the center of the view shifted to the boresight axis. 0.5°/3.10 = 0.161°. This may be further evaluated using the upper form of Eq. (11-14) to give l/s = 0.201 deg. 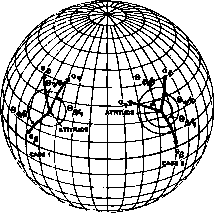 (If the loci at the boundary midway between the two axes formed a rectangle on the celestial sphere rather than a parallelogram, the attitude uncertainty there would be 0.114 deg.) Thus, although the single-axis resolution varies by a factor of 5 over the full range, the attitude uncertainty fluctuates by only about 50%. A similar analysis for a Sun sensor with a 32-deg "square" field of view (Fig. 10-14) and other properties as above gives Us = 0.354 deg at the boresight, 0.308 deg at the center of each edge, and 0.300 deg at the corners. Sections 10.1 through 10.4 described measurements involving one or two reference vectors whose orientation in inertial space is known. The technique that we have used is to examine the locus of possible attitudes for any given measurement to classify that measurement. However, some common attitude measurements do not fall into the basic categories that we have established thus far. One example of such compound measurements is the rotation angle about the attitude from the Sun to the Earth's horizon, The horizon sensor which produces this measurement is assumed to have a field of view which is a point on the celestial sphere, which thus sweeps out a small circle as the spacecraft rotates and provides an output pulse upon crossing the Earth's horizon. 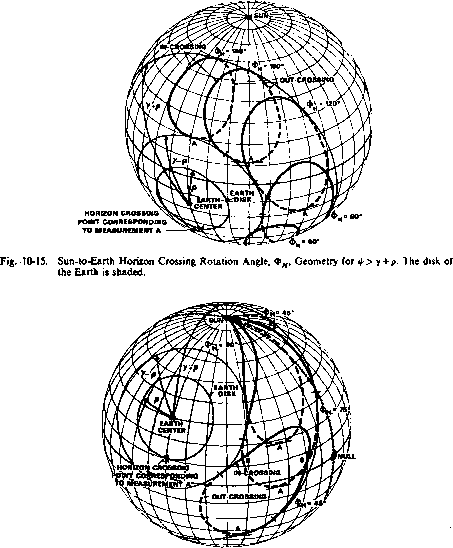 The Sun-to-Earth horizon crossing rotation angle differs from other rotation angle measurements in that the location of the horizon crossing on the celestial sphere is unknown. We know only that the horizon crossing is a given arc-length distance from the nadir vector. Thus, is neither a rotation angle measurement nor an arc-length measurement and the attitude loci corresponding to constant values of do not have the same form as the loci corresponding to /? or <t> measurements. Fig. 10-16. Sun-to-Earth Horizon Crossing Rotation Angle, <t>H, Geometry for r + P- The disk of the Earth is shaded. i s a sensor crossing from space onto the disk of the Earth and Earth-out, or out-triggering, denotes a crossing from the disk of the Earth to space. whenever the constant 4»w loci are tangent to small circles centered on the Sun. Again, these Lp curves are the latitude lines of the underlying grid. Representative points where 0|s/4>JI = O have been marked by the letter,! on Figs. 10-15 and 10-16. 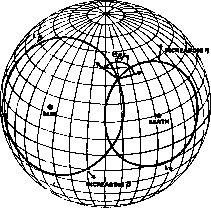 This occurs when the Sun vector, the nadir vector, and the horizon crossing vector are coplanar. Finally, we may determine the attitude by using two horizon crossing measurements, an Earth-in crossing, and an Earth-out crossing. (For example, an Earth-in rotation of 45 deg and an Earth-out rotation angle of 75 deg implies that the attitude must be at one of the two points marked B on Fig. 10-16.) 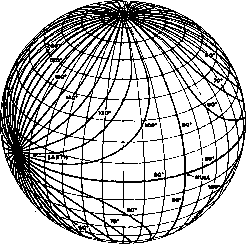 For a spherical Earth, this gives us the same information as an Earth-width measurement plus a Sun-to-nadir vector rotation angle measurement. As discussed in Section 10.3, a singularity occurs in the Earth-width/rotation angle method whenever the attitude lies on the Sun-null great circle shown as a dotted line in Fig. 10-16. At any point along this line, the <PH loci passing through that point are mutually tangent. Although this cannot be clearly established from the figure, it is at least consistent with the shape of the attitude loci along the Sun-null great circle. Thus far we have described procedures for using two independent measurements to determine the orientation of a single spacecraft axis. For single-axis attitude, this is all of the information that is desired. However, to completely determine the orientation of a rigid spacecraft, three parameters must be determined and, therefore, an additional measurement is required. For three-axis-stabilized spacecraft, these three parameters are frequently chosen to be three angles, known as Euler angles, which define how the spacecraft-fixed coordinates are related to inertia! coordinates. This procedure is described in Section 12.1. An alternative procedure frequently used for spinning spacecraft is to define the orientation in space of a single spacecraft axis (such as the spin axis) and then to define the rotational orientation of the spacecraft about this axis. This rotation angle, also called the azimuth or phase angle, may be specified as the azimuth of some arbitrary point in the spacecraft relative to some reference direction in inertial space, as illustrated in Fig. 10-17. In this figure, the underlying coordinate grid is fixed in inertial space. ,Fig.I0-17. Defining the Three-Axis Orientation of the Spacecraft by Defining the Spin Axis and Azimuth in Inertial Coordinates. 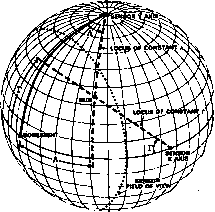 The underlying coordinate grid is an inertial coordinate system. To determine the three-axis attitude specified by the spin axis direction and azimuth, we first determine the orientation in inertial space of the spacecraft spin axis using any of the methods described in Sections 10.1 through 10.5. The one remaining attitude component is then measured by measuring the rotation angle about the attitude between some fixed direction in inertial space and an arbitrarily defined reference direction fixed in the spacecraft. For example, we might record the time at which a slit Sun sensor parallel to the spin axis sees, the Sun and assume that the spacecraft is rotating uniformly to determine its relative azimuth at any other time. 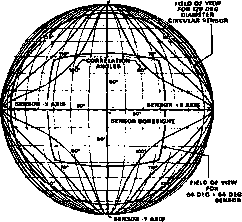 Alternatively, if we are using a wheel-mounted horizon scanner (Section 6.2), we could measure the relative azimuth between the center of the disk of the Earth (midway between the telescope Earth-in and -out crossings for a spherical Earth) and some reference mark fixed in the body of the spacecraft, as has been done for the AE series of spacecraft. 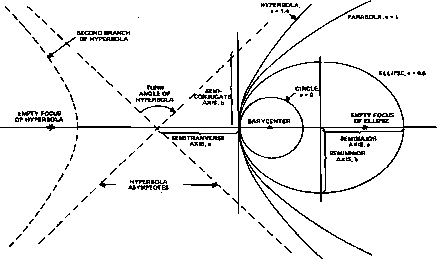 This pitch angle may be used directly for Earth-oriented satellites or, with ephemeris data, transformed into an inertial azimuthal measurement The reference point for the inertial azimuth is arbitrary. 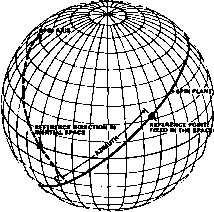 However, the perpendicular projection of the vernal equinox onto the spin plane is commonly used. Another alternative procedure, frequently used on three-axis stabilized spacecraft, is to determine the attitude by measuring the orientation in spacecraft coordinates of two reference vectors fixed in inertial space. For example, three orthogonal magnetometers may be used to measure the orientation of the Earth's magnetic field in spacecraft coordinates. Similarly, a two-axis Sun sensor can provide the coordinates of the Sun vector in spacecraft coordinates. The specification of these two vectors in spacecraft coordinates fixes the orientation of the spacecraft in inertial space. If we are determining three-axis attitude by determining the orientation in spacecraft coordinates of two reference vectors, then all the analysis of Sections 10.1 through 10.5 can be applied directly to determining the orientation of each reference vector. For example, the theory of correlation angles was applied to the output of a two-axis Sun sensor at the end of Section 10.4. Similarly, a single magnetometer measurement in a known magnetic field is an arc-length measurement specifying the angle between the external magnetic field and the magnetometer axis. * The same analytic procedures can be applied to other types of sensors as well.